Lord of the Rings Actor Name-Drops "New Uncharted"
Lord of the Rings and Lost actor Dominic Monaghan may have inadvertently exposed Naughty Dog's next game. Dominic Monaghan recently sat down for a conference call to talk about his role in The Bureau: XCOM Declassified's live-action web series. During the discussion, though, he may have accidentally spilled the beans on a new entry to the Uncharted series. Now, this means one of two things: either Monaghan knows something we don't about Naughty Dog's (currently unannounced) next project, or he's making the baseless but reasonable assumption that one of the most successful franchises from this past generation isn't going to suddenly stop. "I'll always stay focused on the gaming world and see what's coming up," Monaghan said during the call. "The new Uncharted, I'm really excited to see how that's going to be, and obviously both new gaming systems." 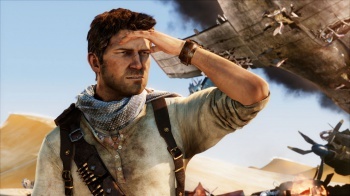 The last game in the main Uncharted series, Drake's Deception, shipped in November 2011 and Naughty Dog has since been occupied with this year's The Last of Us. The studio has been silent as to its plans for the next generation of consoles. Monaghan, who you'd recognize as Merry from Lord of the Rings or perhaps Charlie from Lost, is probably not the best source for leaks of this nature, since (as far as we know) he has no ties to Naughty Dog. Still, his work on The Bureau's promotional materials gives him just enough industry cred to start the rumor mill turning.